On Thursday 24th May Class 2 amazed all the school and invited parents and grandparents with their Blue Whale Worship. 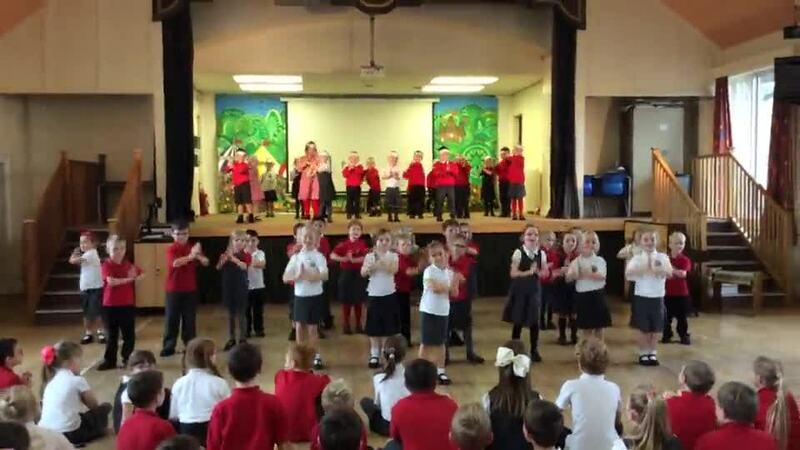 They shared the amazing facts they had learnt and a blue whale song and dance. In our R.E. lessons we have been learning about the Christian ceremony of Baptism. We had our own Baptism service with Reverend Andy, parents and God parents and of course a baby who we baptized Lily Summer. The Best Christmas party Ever!! As part of our Science topic, Looking after our bodies, we have been finding out about how eating a balanced diet with lots of fruit and vegetables can help us keep our bodies healthy. We made fruit kebabs and salad wraps and they were delicious. We also discovered that we liked some foods we thought we didn't!